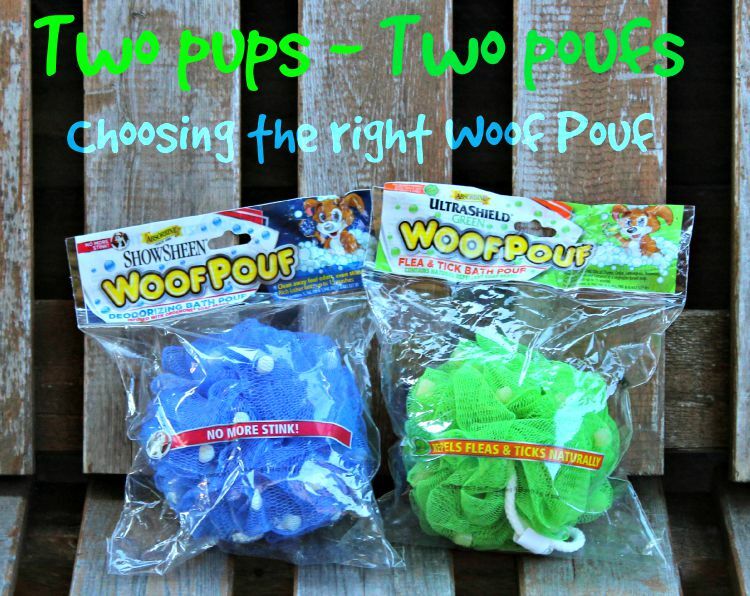 A “Tail” of Two Dogs – Wouf Pouf™ gets it done!!! Two dogs – same breed – very different jobs and very different personalities. 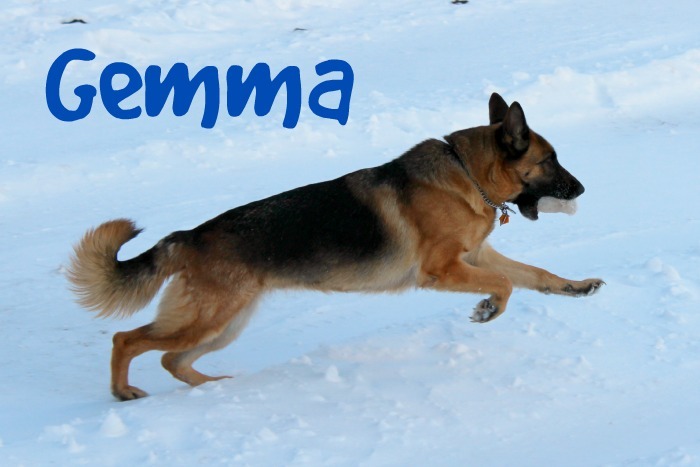 Meet the Thompson family German Shepherds – Malibu and Gemma! Both of the “girls” are working dogs with very different jobs. Dirigo Malibu Beach Vacation is the daughter of an AKC Champion ROM sire. She’s an American-bred dog with a prestigious pedigree, and a solid, stable eager-to-please personality that makes her the perfect dog for her two jobs – service dog and obedience competition dog. She is steady and unflappable, but she is a “girly” dog. She loves to be in the house with Mommy, and she doesn’t like getting dirty or wet. 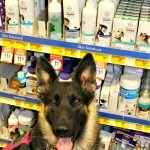 But like all German Shepherds, she can get that doggy smell, and because, as my service dog, she has to accompany me in many public places like stores and restaurants, she needs to smell good. Enter Woof Pouf with their ShowSheen® Wouf Pouf™ …….what a blessing. Like I mentioned, Malibu doesn’t like water or bath time. I put her in the shower and use the hand held sprayer to wet her down and then Woof Pouf™ her quickly. She likes that part of the project because it feels like I’m patting her and she loves “attention”! It’s incredible the amount of lather that those little built-in soap beads produce. 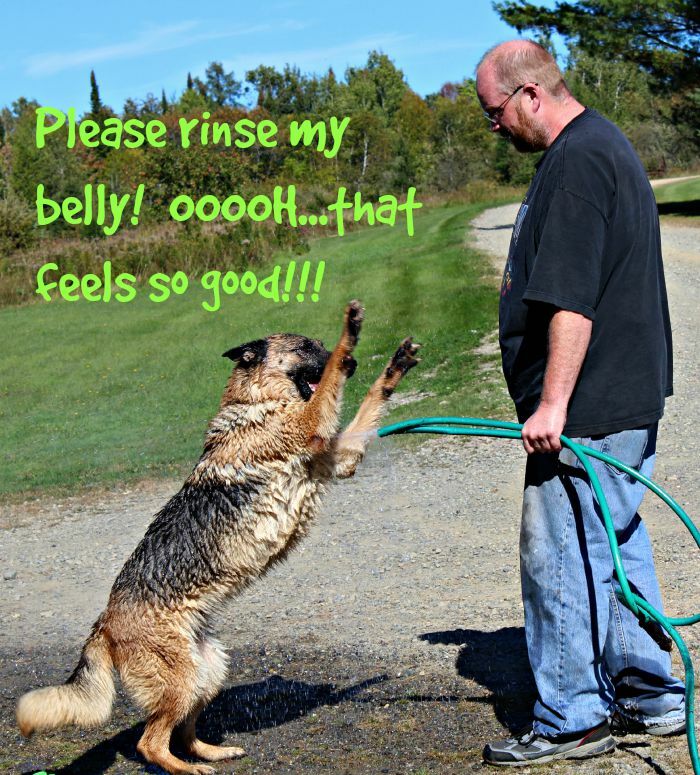 Then it’s a quick rinse and in the words of Taylor Swift – Shake, Shake, Shake! I love the smell of the Absorbine® ShowSheen® Woof Pouf™ . It’s not strong, or perfumy or chemical but instead it’s very fresh smelling and nice. And it sure does get rid of that Shepherd odor! I noticed that the Blue Woof Pouf™ also eliminates skunk odor which is a use plus for me. We know we have skunks that live here on the property as we can sometimes smell skunk odor outside at night (must be a nervous skunk)! Fortunately the girls have never come in contact with one but there is always a first time. It’s nice to know that I will have an effective way to get rid off it. 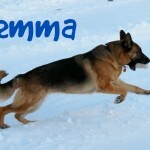 So Malibu is my dog but other German Shepherd, Gemma, is my son Doug’s dog. She is very different from Malibu. 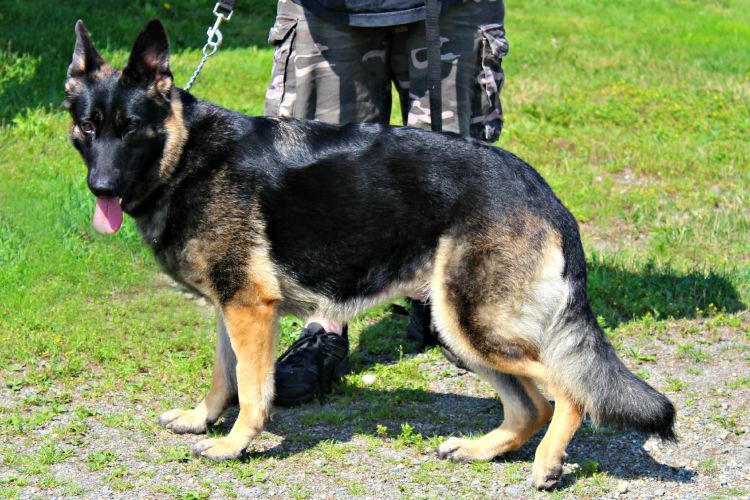 Her heritage is imported German working dog lines. She’s tough, athletic, agile and a little stubborn. 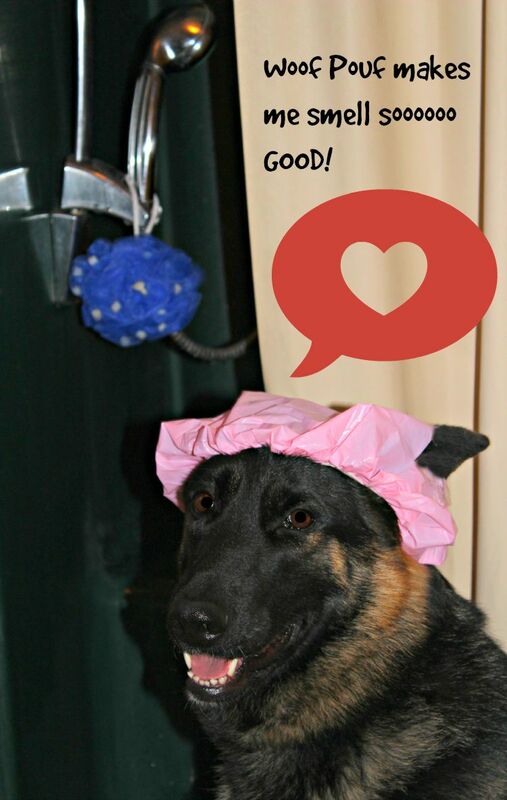 She is the perfect dog for the jobs that she does – home watch dog, search & rescue, and tracking competition dog. She doesn’t mind stormy weather, extreme cold, or charging through swampy marshland. 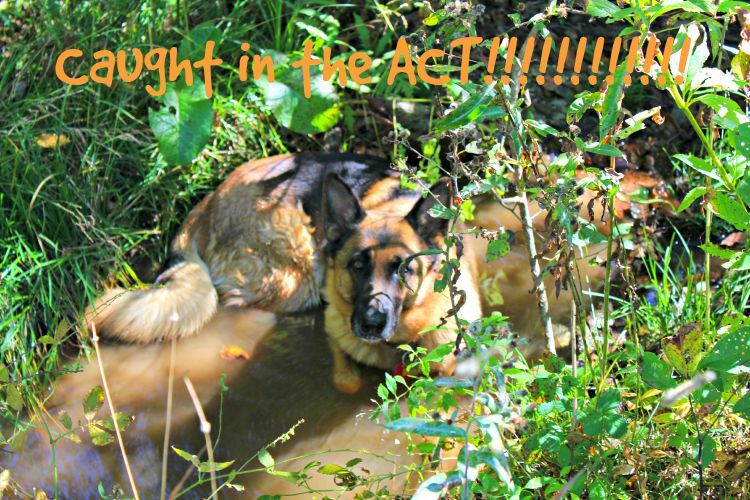 In fact, she loves water and seeks out the wettest, murkiest places she can find, like the little brook that runs through our property. And because of her property patrols, she ends up in areas where its pretty easy to pick up fleas and ticks as she is crossing paths with deer, moose, and bears that often frequent our northwoods yard. In fact, she had a bout with Lyme disease earlier this spring so we examine her thoroughly to prevent any more problems. I love that the UltraShield® Green Woof Pouf™ is made from a natural blend of herbal extracts that are known to repel those little creepy crawlies. Gemma loves a bath outdoors where she can play with the hose. She’s a willing participant as opposed to Malibu who cringes when you say the word. And rinse off time, is pure joy. Gemma loves playing with the garden hose! The folks at Absorbine® want to share some Woof Poufs with The Wilderness Wife Blog readers so enter the giveaway below to win a free 10 pack of the Woof Pouf of your choice.